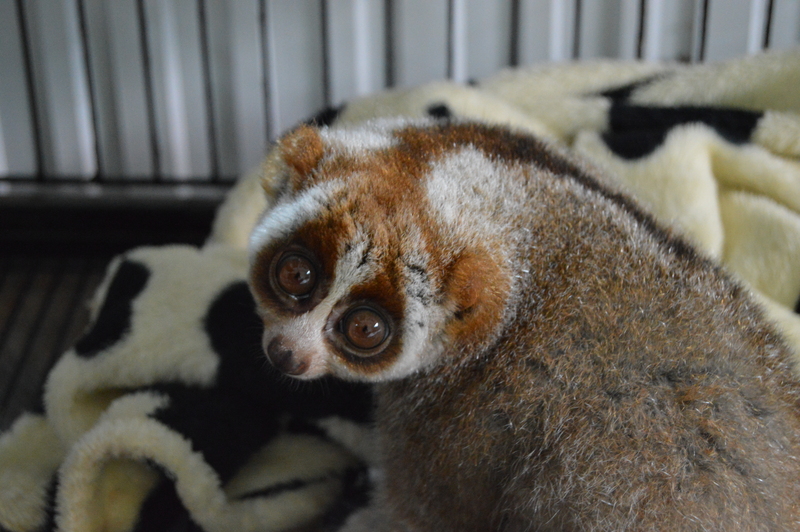 Love Wildlife is dedicated to the protection of slow lorises that involves research, education and rehabilitation. Our first center located in Chonburi, is a collaboration with the DNP Waterbird Conservation Center and currently houses several confiscated lorises which need constant care and support. What is a slow loris? Slow lorises are mammals of the order, Primate, in the paraphyletic group known as Prosimian – which also includes lemurs, bushbabies, and tarsiers. Slow lorises are nocturnal, meaning that they are active during the night and sleep during the day; they are arboreal, spending their lives living in trees. 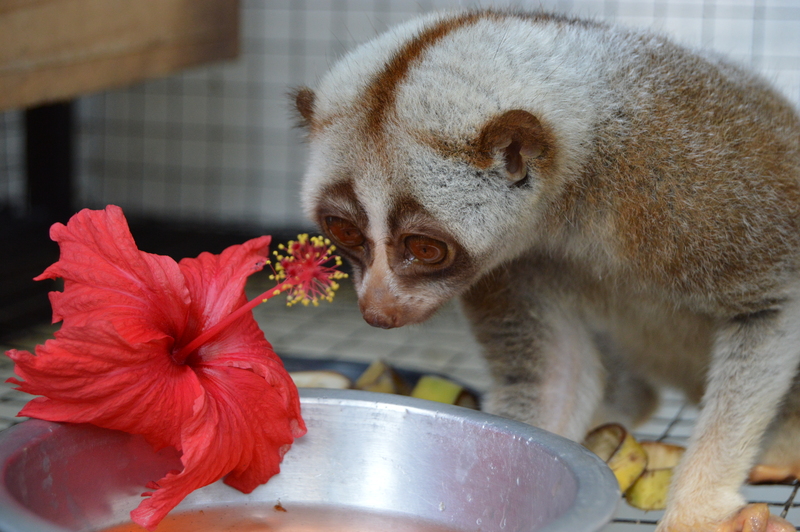 Slow lorises are omnivores, eating small animals, insects, fruit, tree gum, and other vegetation. Why are they called slow lorises? As previously stated, slow lorises are nocturnal animals so they are inactive/asleep during the day. Slow lorises also move slowly and deliberately, making little or no noise, and when threatened, they stop moving and remain immobile. Hence, the ‘slow’ in their names. Slow lorises are native to the rainforests of South Asia and Southeast Asia. 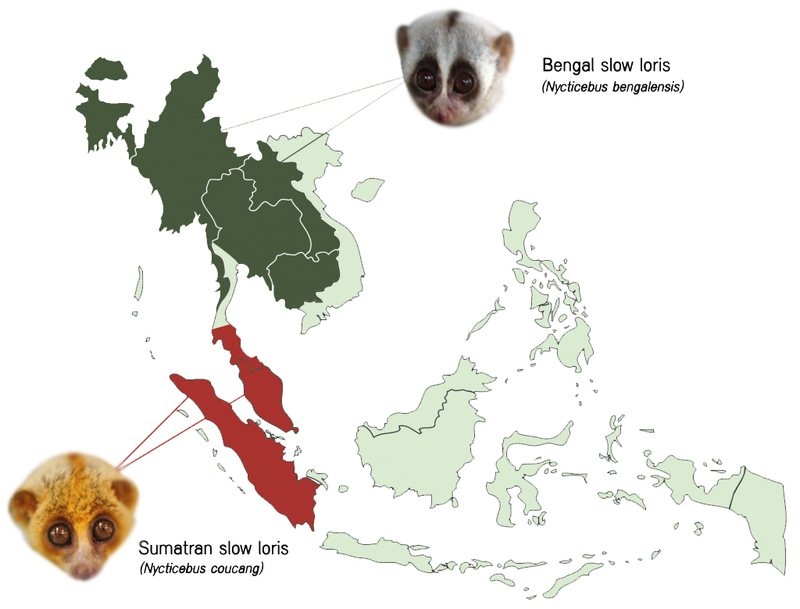 Thailand is home to two species of slow loris; the greater slow loris (Nycticebus coucang) and the Bengal slow loris (Nycticebus bengalensis). What we know about the slow loris is very limited as their behavior in the wild is difficult to study due to their rainforest habitat and nocturnal and cryptic (often relatively solitary, silent and inconspicuous) lifestyles. New species are still being discovered in 2014! Their predators (besides humans) are orangutans, hawk-eagles and snakes; Males are highly territorial; They communicate by scent-marking; They reproduce slowly, and baby lorises are either parked on branches or carried by either parent; And they have a rare and unique trait among mammals – their bites are TOXIC. Is it legal to own a slow loris? All slow loris species are protected by international laws and listed on CITES (Convention on International Trade in Endangered Species of Wild Fauna and Flora) Appendix 1, which means that all trade is illegal. 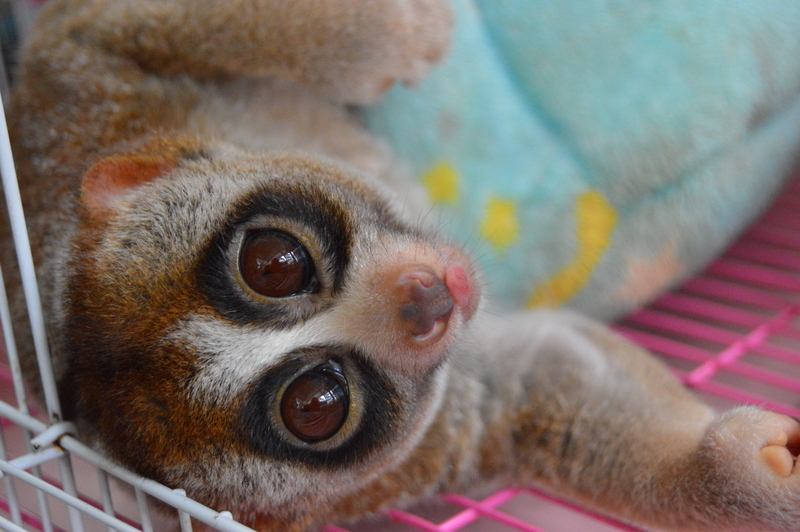 Slow lorises are illegal to buy, sell or solicit! Why we are trying to save these cute, little critters? Because we all have a crucial part, whether large or small, to play in maintaining a healthy, balanced ecosystem – the very building blocks of a living planet – Earth, the place we call home. How are we saving them? 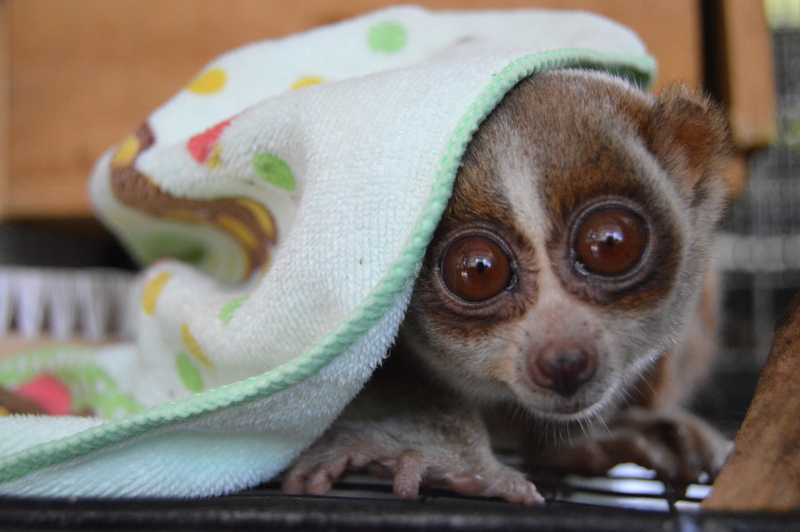 Love Wildlife is encouraging the conservation of the slow loris through our education programs, school talks and Youth Ecological Network (YEN), as well as awareness campaigns to educate and inform the general public of their plight. We are working in close collaboration with Professor Anna Nekaris and the Little Fireface Project to help the slow lorises of Thailand. We are also working together with the Thai Department of National Parks, Wildlife and Plant Conservation (DNP) to help keep slow lorises free in their natural homes and optimize the well-being of captive/confiscated ones. What is happening to the slow loris that they need saving? 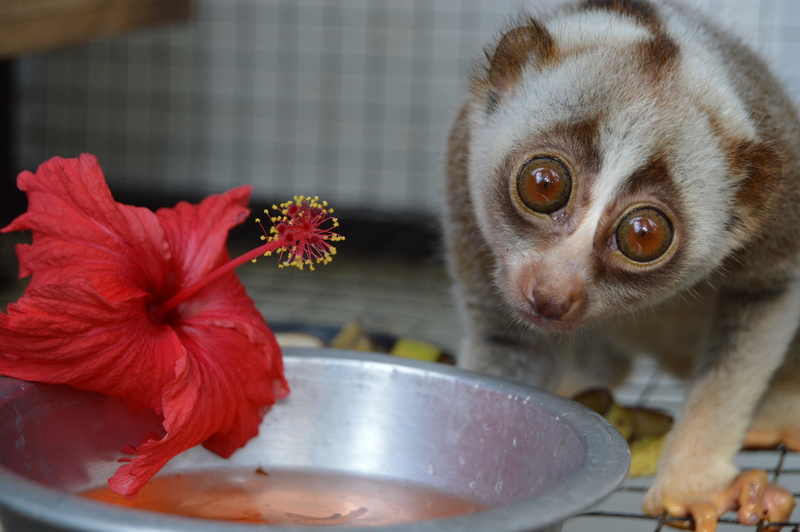 Slow lorises are cute – and because they are so very cute, they are susceptible to…Us. Yes – Us, humans. Our fascination with all things cute and fluffy has led to a growing demand in the exotic pet trade – obviously, not helped with home videos made viral of a slow loris being tickled – and also an exploitation in the tourism industry of slow lorises being used as a cute photo prop. Our need for more space has also resulted in extensive habitat loss to these small creatures. And our desperation and blind faith in mystical healing has also made slow lorises another “novel” ingredient in the world of traditional medicine.